Admit it: Few things are more adorable than seeing a flock of children toddle around in princess and Buzz Lightyear costumes, with puffy jackets and tights bundled over frilly dresses. This chilly pre-Halloween weekend saw youngsters and their families flocking to Franklin Square Park for Historic Philadelphia’s first-ever PumpkinFest. A fundraiser for the Square, it was filled with holiday fun for the little ones, including picking pumpkins from a patch to paint, decorating cupcakes with candy galore, going bananas on a moon bounce and much more. SquareBurger provided seasonal nosh for the event, including some fantastic vegetarian Sloppy Joes and hot cider. A very special guest of honor, our very own Phillie Phanatic, even made an appearance in Batman attire to lead a costume parade around the park. 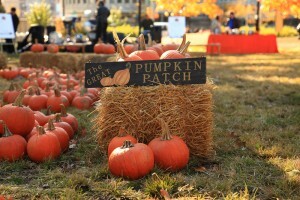 The first annual PumpkinFest took place in Franklin Square Park Oct. 30 in a fundraiser for the Square for the whole family. Between carnival games and merry-go-round rides, PumpkinFest-goers could kick back and listen to some live musical performances. Songwriting duo Two of a Kind, aka David and Jenny Heitler-Klevans, shared their classic children’s songs such as “Family Tree.” Philadelphia School of Rock showcased some of their talented future rockers; Averi Bent-Cole rocked the bass and keys, Dylan Long and Tristan Walker game some killer percussion and Tim Green snarled through such numbers as Blue Oyster Cult’s “Godzilla” and the Beatles’ “Helter Skelter.” Some other attractions included a haunted miniature golf course and the pint-sized Lightning Bolt Express train. On one side of the park, a fellow in a miles-high striped top hat and crazy white hair was waiting to greet kids with a smile and a T-shirt advertising his new animated short, “Mr. Halloweenster.” The Halloween man himself, otherwise known as Noam Kugelmass, got the idea for a Halloween-themed hero after he put together his quirky costume. Kugelmass realized that there was a lack of iconic Halloween characters after boys and girls questioned whether he was the Cat in the Hat, and one mom quipped, “Who are you supposed to be, the Mayor of Halloween?” The inspiration to put together a film wasn’t far behind. Its moral? “The fun of Halloween isn’t candy,” Kugelmass explained. “It’s about imagination and creativity, about being with your friends and being silly.” Mr. Halloweenster’s holiday-saving adventure can be found on YouTube as well as www.mrhalloweenster.com. I had the wonderful opportunity to speak to Amy Needle, president and CEO of Historic Philadelphia Inc. Needle was very excited about the event’s inaugural year, as well as what it strove to achieve. “The event raises funds to keep the park beautiful,” she said. “We’re happy so many people came out to support the square.” Needle hopes that the PumpkinFest will be something that families can enjoy for years to come, and with so many folks braving the cold to join in the fun, things are looking promising for the fledgling Halloween festival.